It is commonly found that charities set up in previous centuries have much diminished in their financial output or have even disappeared. The several charities associated with the ancient parish of Giggleswick are probably typical of those in many other parishes in Craven and elsewhere. Some are listed in Giggleswick Church. The idea of charitable bequests in pre-Reformation times was to help assure a place in Heaven. In later times relief of poverty came from private initiatives by better-off individuals, as evidenced by wills from the 16th and 17th centuries, and from the poor rate system imposed on parishes by the state. The Poor Law Acts of 1597 and 1601 in Queen Elizabeth’s time were passed to prevent disorder. These and later Acts of Parliament reveal the harshness of the system. Charity was rather grudgingly dispensed by the parish officials and beset by restrictive rules (Tate, 1969; Gudgeon, 1999). The workhouse beckoned the poor. The Giggleswick parish register has detailed references to paupers in the burials recorded in the period 1784 to 1795 but only rarely for other times. In this period 27% of those 549 people buried were stated to be paupers. An investigation of the background of those charities benefitting Langcliffe exemplifies the relevant sources of historical information. The starting point is the website of The Charity Commission for England and Wales, which for existing charities gives details of the governing documents, if known, the objectives of the charity, the areas of benefit, the registration history and the current trustees. Two charities discussed in this article concern beneficiaries in Giggleswick and the local townships of Langcliffe, Rathmell, Settle and Stainforth. One is the main charity of Thomas Foster (Main Charity 501797) with subsidiaries Poor Close (501797-2) and Poor’s Allotment (501797-1) all registered in 1972. The second is the Robinson charity (Removed Main Charity 225289). The current trustees do not hold any historical documents about these charities. The Foster charity is for the benefit of the poor and is based on the will of Thomas Foster made on Christmas Day, 25 December 1692, subject to a modifying Scheme of 1902. The originator of the Poor Close and Poor’s Allotment was said in 1893 by the Charity Commissioners to be ‘not well known, but there is reason to believe it may be ascribed to a person named Thornton’. The Robinson Charity was set up by the Reverend John Robinson by will of 26 February 1886 for the benefit of the aged and infirm of the Old Parish of Giggleswick. It was closed down by the Charity Commission in 2000 since it had apparently ceased to exist. Thomas Foster, Mr Thornton and John Robinson are the particular subjects of this article. A useful source of information proved to be Reports of the Charity Commissioners undertaken in 1893. All the charities for the Townships of Giggleswick, Settle, Rathmell, Stainforth and Langcliffe are described. It was hoped that an earlier set of Reports of the Commissioners Charities and Education of the Poor in England and Wales (1815-1839) might give more information, but the content proved identical to that of the 1893 reports. The later trustees’ accounts books provided further detail. The current papers held by trustees for the ‘Foster and Poor Close’ charity run from 1902. In 1907 the Scheme of the Charity Commissioners united the Thomas Foster and Poor’s Allotment (including Poor Close) charities and renamed them the ‘Charity of Thomas Foster and Another’ re-registered as GG 240,293. In 1965 the Charity Commissioners admitted an error in registering Foster and Poor’s Allotment as ‘separate charities 220,891’ in the 1963 Charities Act 1960, Registration of Charities, and re-registered them as 240,293, The Giggleswick Charities. The Foster, Poor Close and Poor’s Allotment charity was finally registered as Main Charity 501797 in 1972. The Slaidburn parish registers show that Thomas Foster de Slaidburn, of Townhead, gent. was buried in 1692. At that time Townhead was the home of the Wiglesworths. It is assumed that he was born in Giggleswick parish since the Slaidburn parish register makes no mention of his baptism. In trying to trace Thomas’s family using the Giggleswick parish registers, it seems possible to suggest that he was baptised in 1607, the son of William Foster who married Jane Balye in 1605. 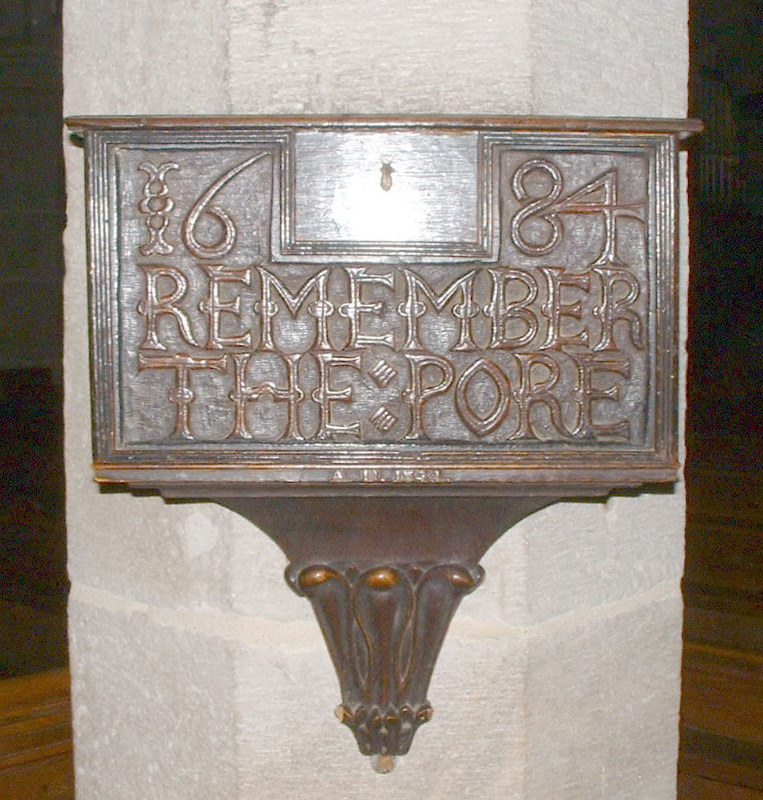 William might have been the son (baptised 1588) of John Foster. It is a pity that we cannot do more than speculate about Thomas’s ancestry or the source of his wealth. Thomas Foster was living in Slaidburn, as an old man probably living in one room, with his Wiglesworth relatives, at the time of his death, and he left money for the poor of the parishes of both Slaidburn and Giggleswick. The sum of £100 (now worth about £160,000 based on average earnings) was used to purchase a rent charge of £5 a year on ‘a messuage called Blackhouse, within Essington in Bolland, and certain closes thereto belonging, containing by estimation 80 acres’. This rent charge was granted by deed to the churchwardens and some of the sidesmen of Giggleswick as trustees. The rental income was divided into four equal portions for Giggleswick, Settle, Stainforth and Rathmell with Langcliffe (3/5 to Rathmell and 2/5 to Langcliffe). The trustees were later elected by the Giggleswick Select Vestry of 24 members. Thomas mentions people in Deepdale Head (Wigglesworth) and Stackhouse (Thomas Carr his nephew) so he had family members in the Giggleswick area. In 1926 the owner of the Blackhouse estate at Bowland subject to the rent charge of £5 a year was allowed by the Charity Commissioners to redeem the charge by buying £200 worth of 2½ % Consols (a Treasury stock) producing a fixed yearly income of £5. This stock was transferred to ‘The Official Trustees of Charitable Funds’. The market price was £112 plus stamp duty of 12/6d. Thus the owner disengaged from Foster’s bequest at a cost of about 22 years future rent charge. In 1963 the stock was worth £89 with dividends going to the Midland Bank in Settle. In 2009 the stock was worth £105. Inflation has destroyed the value of the fund. The Poor Close and Poor’s Allotment funds were said in 1893 by the Charity Commissioners to be associated with a Mr Thornton. He was considered to be an elusive man until Mr Reg Postlethwaite acquainted us with the will of Christopher Thornton, made in 1656, which notes that Thomas Foster of Slaidburn (the same man as discussed above) is Mr Thornton’s cousin. Christopher Thornton was a church clerk of Crowsnest, Clapham. He bequeathed books, a wooden cabinet and a wrought cabinet, a clock, and lands including ‘to the poor of Giggleswick one piece of ground lying within the town fields of Giggleswick commonly called the Wythies Close as also my sheepgates which I desire may be let out and the Lord’s rent first discharged the remainder to be distributed to the poor of the parish’. The Wythies Close is not listed under that name in the Tithe Assessment of 1841/4, nor is any similar name, but we may presume that it became known as the Poor Close which is a meadow off Brackenber Lane in Giggleswick (2.56 acres behind the old slaughterhouse). The Poor’s Allotment is 13 acres of pasture near Buckhaw Brow above Giggleswick Scar. Mr Thornton also left £40 for the poor of Clapham. The extant documents concern only disbursement of money, not the original source of the money. However, the Giggleswick parish registers are more revealing. The parish memoranda for the period 1677 to 1746 refer in 1715 to ‘29 sheepgates and a ramgate on Giggleswick Scar, always claimed to belong to the premises late Mr Thornton’s gift at 9s yearly rent.’ This is presumed to be the Poor’s Allotment in the absence of any other source of information. Other references dating from 1715 to 1746 give details of rent received from various persons but only for ‘the Poor Close, Mr Thornton’s gift’. The rent for the Poor Close varied from 11s to 17s with 2s deducted for the Lord’s rent (the owner). In 1743 there was ‘11s from Mr Hardicar by payment of William Birkitt for Poor Close for the use of the Poor House keepers in the parish of Giggleswick’. The fields were rented to the highest bidder each year decided by public tender advertised using printed posters. The Foster and Poor Close trustees’ Treasurer’s Acts Book for 1902 to 1962 shows the income received as rent of the Poor Close and Poor’s Allotment of about £20 a year, which was then divided between the Giggleswick townships. The Poor Close is a meadow off Brackenber Lane in Giggleswick (no. 250 in 1958, 2.56 acres; behind the old slaughterhouse). The Poor’s Allotment is field no. 574 (in 1958) of 13.026 acres of pasture near Buckhaw Brow above Giggleswick Scar and was sometimes referred to as Poor’s Scar in the treasurer’s notes. The field numbers are different on the Tithe map of 1841/4, being 208 Poor Close and 404 Poor Scar. Annual tithe payments were due on income, ranging from 4s 7d in 1902, to 6s 2d in 1950. In 1954 compulsory redemption of tithe annuities of £1 or less was required so a payment of £6 12s 11d was assessed for the two fields. The trustees had to ask for a delay in payment because no capital was available - all income was from rent payable at the end of each year. This was agreed by the Charity Commissioners. Other taxes than tithes were also imposed. In 1943, 1944 and 1945 a War Damage Contribution was due - 5s 1d on Poor Close and 2s 4d on Poor’s Scar. A Land Tax was due on Poor Close of 2s 3d in 1946, 7 and 8 (for agricultural land but not grazing land). So by 1960 income was typically £22 from the two fields with no taxes to pay. Occasionally a donation was made by the Settle Area Community Council. By the 1970s total annual income was about £40. An offer was made in 1979 to buy the Poor’s Allotment (Poor’s Scar). It was felt by the trustees that land was a safer investment than cash and the offer was turned down. John Robinson was born in Settle in 1825; his father William Robinson was Justice of the Peace in 1851 and a banker living on Duke Street, in the house thought to be Cragdale (Mitchell, 1993). In the 1851 census John is stated to be ‘BA clergyman without cure of souls’. Crockford’s list of clergy confirms John as BA (Cambridge), living in Settle. The 1861 census shows him in Duke Street as a clergyman of the established church and the 1871 census states that he was married and assistant curate of Sidmouth in Devon where he was then living. The two Settle schools, for boys and girls, were set up in about 1816 by public subscription on land in Kirkgate given by John Robinson’s maternal grandfather John Peart. Together with his father William, John and several friends had built school classrooms and a Master’s house on a site under Castleberg in 1856 (Mitchell, 1993; Charity Commission, 1897). The boys’ and girls’ schools were amalgamated in 1856 and became the National School on the Castleberg site. John Robinson conveyed the National School and the land on which it stood to the curate and churchwardens of Settle in return for the small plot in Kirkgate on which the earlier schoolrooms had been built. The Rev. John Robinson’s Charity was set up by will of 1st November 1882, proved at Exeter in 1886. He bequeathed to ‘my friends John Birkbeck junior William George Perfect and Charles Henry Charlesworth and my nephew John George Robinson the sum of £5000 … to be held on trust … and apply the income towards the Endowment of Almshouses, or otherwise for the benefit of the aged and infirm poor in the old parish of Giggleswick’. In 1888 the money was used not to set up almshouses but to purchase £4907 19s 5d worth of 3% Consols, converted to 2¾% New Consols in 1888, to produce £33 14s 10d given to local people every quarter. No person under 60 or in receipt of parish relief was eligible. In 1894 the Consols were sold and the money was invested in Highland Railway 4% Preference Stock to yield £102 p.a. and London and Yorkshire Railways (LYR) rent charge stock to produce £50 p.a. In 1923 the railway formerly LYR then LNWR (London and North Western Railways) merged with others to form the London, Midland, Scottish (LMS) but annual payments remained the same, at least up to 1945. Nationalization of the railways took place in 1948 and it is not known what happened to the stock. John’s nephew John George Robinson (a trustee) lived in Skipton and married Mary Perfect. One of their children was Geoffrey Robinson who changed his family name to Dawson in 1917 to inherit Langcliffe Hall (Wrench, 1955). Geoffrey was the famous editor of the Times. His son Michael is recorded in Langcliffe Parish Minutes of 1974 as being approached about two replacements to maintain the four trustees. Michael died in 1976. Thereafter there is no local record of payments made by the John Robinson charity. The charity was removed from the Charity Commission records in 2000, and the records destroyed, since it had apparently ceased to exist. The Stainforth Parish Minutes (for 1894 to 1989) show payments of a few pounds per year from the Foster and Poor Close and Allotments Charities but there is no mention of Robinson from 1882 onwards. In about 2000 the then vicar, who understandably did not know about the Robinson charity, gave an account book to Giggleswick Parish Council for safe keeping. This book reveals the Robinson charitable disbursement details from 1886 to 1945. At first cash was disbursed by H.G.Perfect, J.G.Robinson, and C.H.Charlesworth. By 1899 Mr T. Dixon was in sole charge of disbursements, and after his death in 1916 John W. Butterworth took over. F.H.Lister, thought to be manager at Martin’s Bank, eventually owned by Barclays, then took charge. After 1924 it seems that the railway stock was held by the Charity Commissioners and that the bank manager was responsible as a trustee for disbursement of cash, usually from £1 to £2-10-0 per person, to a long list of individuals. These amounts of money given were substantial relative to wages for working people, being equivalent to about the current minimum weekly wage. So where was any remaining stock or capital monies which belonged to this supposed now defunct charity? A chance remark by Mr Jordan, solicitor in Settle, (the firm used to be Jordan, Charlesworth and Co.), in January 2008 led to the discovery that the account was still held by Barclays Bank in Settle. After considerable tortuous discussion the small amount of capital was transferred into the care of the Trustees of the Thomas Foster main charity in April 2008. The Bank also gave a small donation to the charity. Once more, legal restrictions on charitable fund holdings and inflation have destroyed most of the value of John Robinson’s bequest. The original £5000 would now be equivalent to over two million pounds based on average earnings. These charities have helped many people over three hundred years, but no doubt were of greater monetary significance in their early years. The current values have been much eroded by 20th century inflation and because charitable trust investments had to be in secure fixed interest stocks and not speculative shares. Now the use of the small income has had to change to suit present-day circumstances since identification of the ‘aged and infirm poor’ raises problems. The originators of these charities should not be forgotten despite the more limited impact on present society and the historical context ought not to be lost. At the instigation of Chris Ellis of Langcliffe this account of some local charities has been compiled jointly by Mike and Mary Slater and Pat Smelt of Langcliffe and Rita and Phil Hudson of Settle, with helpful suggestions made by Sylvia Harrop. To A. Fawcett, A. Pedley, and K. Coote, parish clerks, for help in inspecting Minute books and finding the Robinson account book. N. Mussett for checking Giggleswick Church records. Mr D.M. Jordan for information concerning Mr Edgar Brown’s involvement in later years. Mr R. Postlethwaite for the will of Mr Thornton. 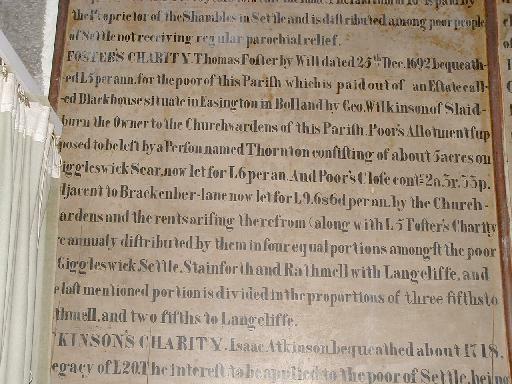 ‘Charity of Thomas Foster and Another’. In 1965 the Charity Commissioners admitted an error in registering Foster and Poor’s Allotment as ‘separate charities 220,891’ in 1963 (Charities Act 1960, Registration of Charities) and then re-registered them as GG 240,293 The Giggleswick Charities. Thomas Foster (main charity 501797) with subsidiaries Poor’s Allotment (501797-1) and Poor Close (501797-2) were all registered in 1972. Charity 225289 set up by the Reverend John Robinson by will of 26 February 1886 and Scheme of 1971 for the benefit of the aged and infirm of the Old Parish of Giggleswick. Reports of the Charity Commissioners, 1893. Endowed Charities, Administrative County of the West Riding of York; and the County Borough of Bradford. vol. II North Western Division. (University of York, Morrell Library). Published in 1897 by House of Commons. British Parliamentary paper HC251 was also produced just prior to the combined national report of 1893. Reports of the Commissioners Charities and Education of the poor in England and Wales 1815-1839. York, West Riding vol. XL, House of Commons. (York Minster Library Y/K3CHA). Foster, Thomas. 1692. Borthwick, Prog./Exchequer wills Jan.-Mar. 1692/3, Probate Craven 21 February 1692/3. Gudgeon, R., 1999. Lawkland Poor House, North Craven Heritage Trust J., p.9. Mitchell, W.R., 1993. A popular history of Settle and Giggleswick, Castleberg. PCC will of Christopher Thornton, 11 February 1658, PROB 11/273 (Documents on Line). Robinson Charity account book. Now lodged with the North Yorkshire County Record Office, Northallerton. Tate, W.E., 1969. The Parish Chest, 3rd edit., CUP. Wrench, J.E., 1955. Geoffrey Dawson and our Times, Hutchinson. Thomas Foster by Will dated 25th December 1692 bequeathed £5 per annum for the poor of this Parish which is paid out of an Estate called Blackhouse situate in Easington Bolland by Geo. Wilkinson of Slaidburn the Owner to the Churchwardens of this Parish consisting of about 5 acres on Giggleswick Scar, now let for £6 per annum. And Poor’s Close containing 2 acres 3 rood 33 poles adjacent to Brackenber lane now let for £9 6s 6d per annum by the Churchwardens and the rents arising therefrom (along with £5 Foster’s Charity) are annually distributed by them in four equal portions amongst the poor of Giggleswick, Settle, Stainforth and Rathmell with Langcliffe, and the last mentioned portion is divided in the proportions of three fifths to Rathmell, and two fifths to Langcliffe.